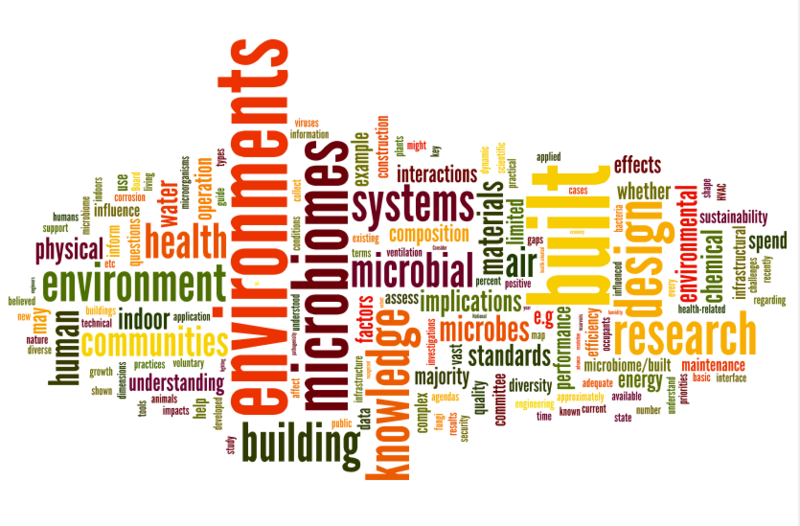 Videos of talks from “Microbiomes of the Built Environment: From Research to Application” – microBEnet: the microbiology of the Built Environment network. On April 11 there was a meeting in Washington DC that was part of an effort from a new study being conducted by the National Academies of Science, Medicine, and Engineering on “Microbiomes of the Built Environment”. Videos and slides from the meeting have now been posted. I have compiled them below. In addition, I made a word cloud using “Wordle” of the main text in the Agenda document describing the “Project Prospectus” of the working group. I think it sums up things pretty well. Paula Olsiewski, Alfred P. Sloan Foundation. Slides. Gary Andersen — What makes the built microbiome unique? Slides. Jelena Srebric — Ventilation, Occupants, and the Microbiome. Slides. Benjamin Kirkup — Built Environment Microbiome and Health. Slides. Amy Pruden — Understanding Microbiomes in Water. Slides.